2018. 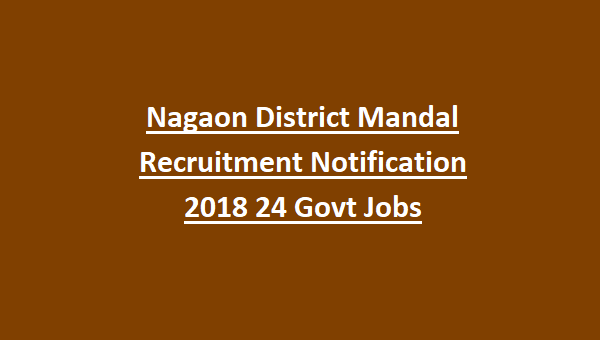 Applications in a prescribed format only accepted for this Nagaon District Mandal recruitment 2018. Last date to submission of application for this Mandal posts of Nagaon District is 10-08-2018. Candidates selection for this Nagaon District Mandal vacancy is on basis of interview only. Official website for this Nagaon District is www.nagaon.gov.in. 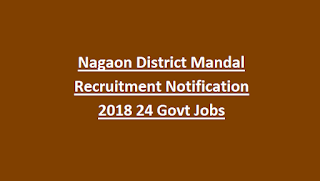 Brief details about this Nagaon District Mandal jobs are given below. Interview date will be given in Admit card. There are total 24 Mandal posts in this Nagaon District Land Record Branch. As on 01-01-2018 age limits are 18-38 years. For reserved candidates upper age limit is relaxable as per the norms. Candidates must have passed HSLC and 6 months recorders class course certificate. Candidates selection is based on personal interview. At the time of personal interview must have shown the all original documents. Interested candidates can submit their application form in a prescribed format on or before the 10-08-2018. Attach all the required documents copies along with application form. 4. Three passport size photos one shall be pasted on application form. 6. 6 Months RCC training Certificate.